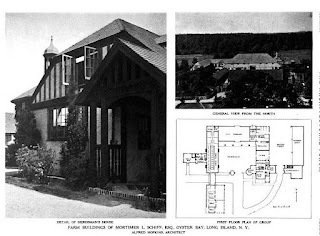 The Alfred Hopkins designed farm group to 'Northwood', the Mortimer L. Schiff estate designed by C.P.H. Gilbert c. 1905 in Oyster Bay. Click HERE and HERE for more on 'Northwood'. Click HERE to see the farm group on google earth and HERE on bing. Northwood owner Peter G. Schiff's nom de course was Fox Ridge Farm. I've always wondered if he kept any of his notable race horses such as "Naughty New Yorker" (voted 2007 New York-bred Horse of the Year) or his multiple Grade 1 mare Riskaverse there at the stable group. Hopkins was a versatile guy! That depends on your definition of "intact"...as the original Northwood was demolished. "Alfred Hopkins, 71, An Architect Here, Designer of Federal Prisons at Lursburg, Pa., and Terre Haute, Ind., is Dead, also Planned Estates, Wrote Book on Specialties -- Was musician, Composer and Student of Bookbinding." New York Times, May 6, 1941. Though the current house ain't no slouch either. A great deal of the Northwood land is now conservation land. The farm group and house and stable groups are separately owned. Kellsboro, I have to agree about Hopkins---interesting he chose farm groups as his specialty. Would love to have seen more of what he could do with a house. This farm group at Northwood just gets better every time I look at the pictures. understood about the loss of the first house, but the replacement is as D.E.D. says it is not a slouch. i asked earlier as the Google map shows an outline of a very large area that is seemingly undeveloped. is most of that area/ acreage conservation land? I believe I read at one time that the house was owned by the well-known publisher of a very famous rock and roll magazine. Also, are there two Northwood farm groups? What is the other grouping nearer to the house? the grouping nearer the house is the garage and stable group---and a recreation complex/indoor tennis court near that. This was owned, since the '80's , by Frank and Nancy Richardson. Decorated by Henri Samuel at enormous expense. Mr. Richardson got it in the divorce and tried to sell it for many years. 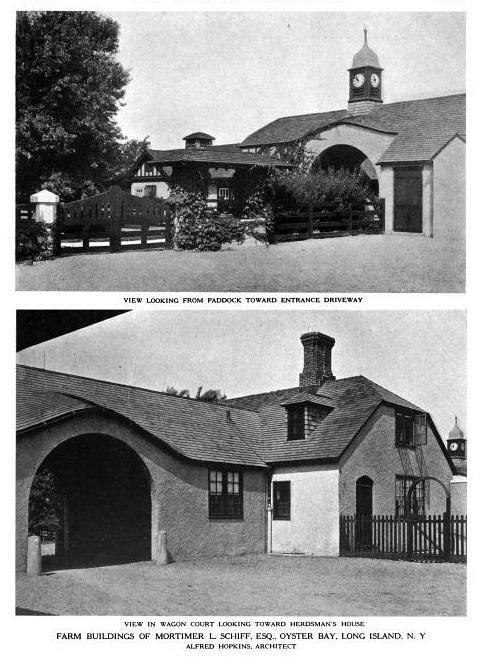 The original house had a fire, as I recall, and was replaced with the smaller current house by Dolly Schiff, who was the daughter of George and Edith Baker of Viking's Cove. Sorry! Edith Baker Schiff, not Dolly! I don't know what I was thinking.